Snowy Owl Update: Healing Fast! 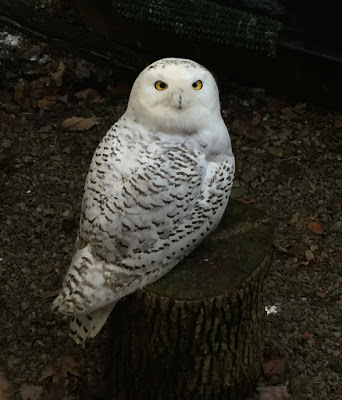 Can a Snowy Owl Ask for Help? A 3,112-acre happy hunting ground for Owl! Presque Isle State Park is a mighty nice hunk of habitat for a snowy owl. Comprised of marsh, dune, and Lake Erie shore, it undoubtedly looks a whole lot more like home to an Arctic owl than do the unbroken forests of West Virginia and southeast Ohio, described by Project SNOWstorm co-founder Scott Weidensaul as "hostile territory." This map makes me happy. 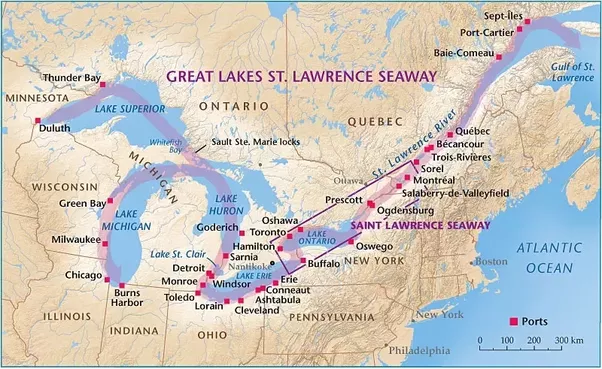 Find Erie on the south shore of that inland sea. Owl originally made his way far enough south to be just off the map, just below the lower notch in the Ohio/West Virginia border. By being driven to Presque Isle, he's been given a great boost north, 260 miles or more, the best chance the team could give him. There's lots of great snowy owl habitat all around. This wild beachy finger of Pennsylvania has the creatures Owl should be hunting: voles and rabbits and gulls, sea ducks and geese. No more quail and rat, served up on a wooden shelf. He's on to bigger game, and he's fit, fat, and ready to hunt. A flight of scaup, part of Owl's food base in his new home. He might be watching where they go to roost at night. He may swoop soundlessly down and pluck a scaup from the water's surface at 2 AM. Who knows what he will do here? Wouldn't we love to know! The owl was packed in the same wild turkey box in which he traveled to Morgantown. It's tall and narrow and confining; it won't let him spread his wings or beat up his feathers. The rush about releasing him is that the longer he stayed in the small wood-sided mew, the wilder and more rambunctious he got, and the more chance he had of battering his feathers into uselessenss. And we didn't want that. The long trek to open ground, hearts beating in anticipation. I got the sweetest email from photographer and saw-whet owl researcher and bander Joey Herron when I asked to borrow his photos for this post. I wanted to share his own words, because they show how this bird touches lives, and the kind of awe and respect he inspires. "As I downloaded these pics I was overwhelmed with emotion at the honor of being a part of this! The experience will ever be etched in my soul!.....sorry you did not make it. I know you would have felt the same! These birds have such a presence about them.....as my wife said when you spread their wings it's like an angel from heaven! Majestic and beautiful! On their way out the point, the team found a red-morph eastern screech-owl. I've also included a couple Screech owl pics....this guy was just sitting along the road! 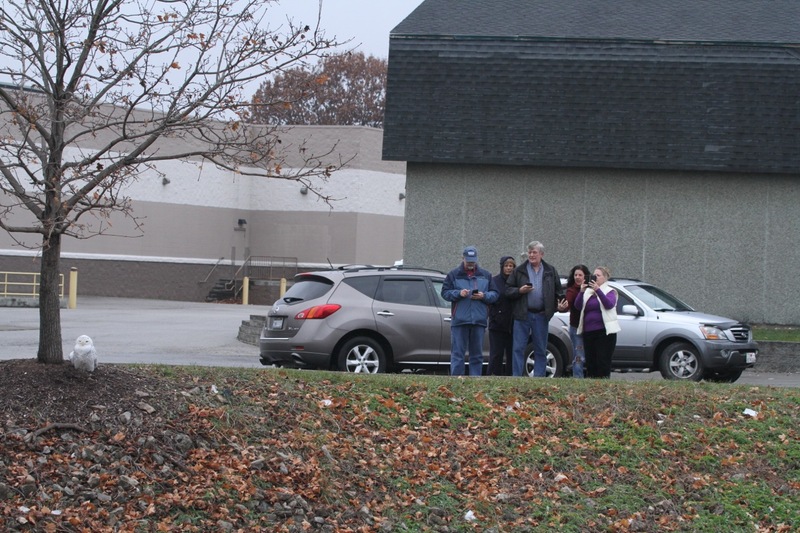 There were a dozen people or so with scopes and cameras across from it looking and taking pics......we stopped to see what was happening........little did these people know that in the back of our car was a Snowy Owl in a box!! !......if they only knew!!!" RELEASE: January 20 2018 (a month after being taken in Dec. 21). We are very happy to announce that the snowy owl from Vienna, WV, successfully returned to the wild today! 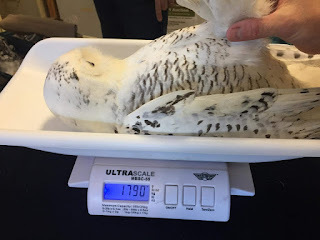 The injured snowy owl was captured several weeks after being hit by a car; the owl suffered a fractured coracoid (a bone in the shoulder) and was emaciated at the time of capture, weighing only 1100 grams. 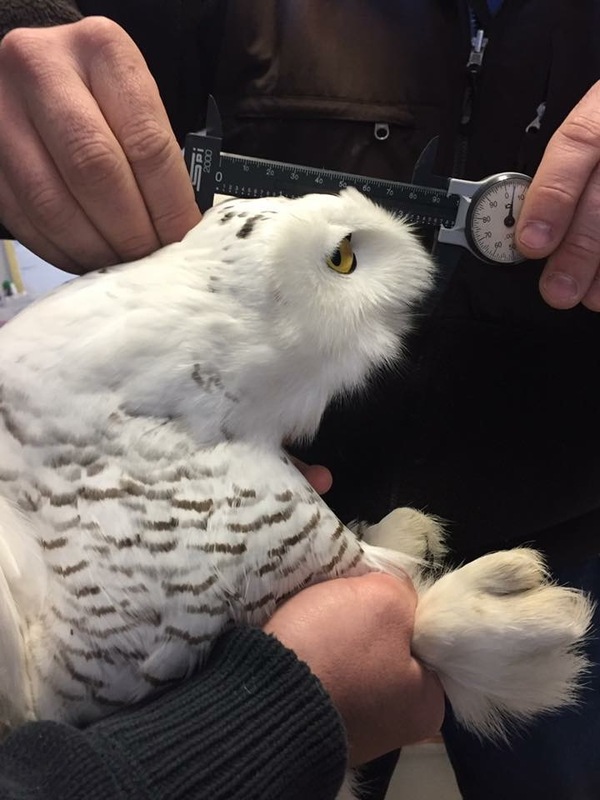 Today, the owl weighed approximately 1800 grams, and he had fully recovered from his injuries. While we would normally release injured birds back where they were found, this snowy owl was out of his normal winter range. We released him several hours north -- on Presque Isle along Lake Erie -- where snowy owls are routinely sighted in the winter. This area is near the southern edge of their normal winter range. 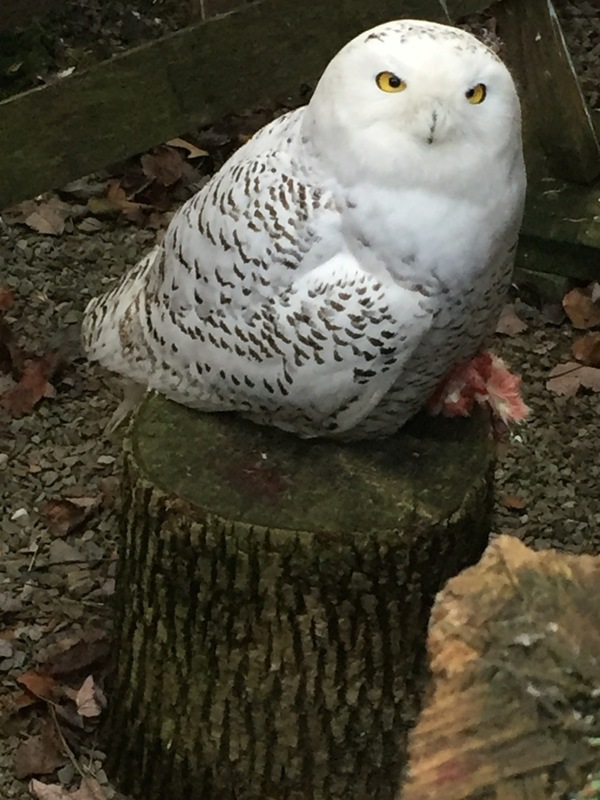 Thank you so much to everyone who sent the snowy owl well wishes, donations towards his care and feeding, and healing thoughts. He certainly has a lot of friends, and he touched many lives. 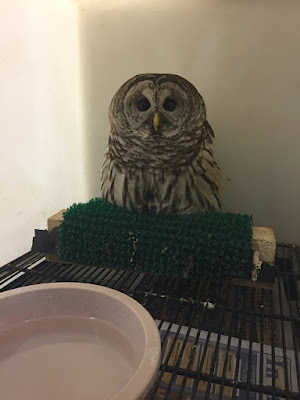 Thank you to everyone who assisted and participated in his capture; thank you to the folks who documented and photographed the owl and his progress; and a huge thank you to the ACCA's volunteers for feeding, medicating, monitoring, cleaning up after, and nursing the owl back to health over the last month or so. 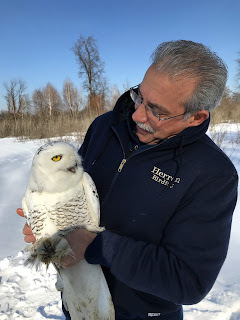 Thank you again -- and best wishes for a long, healthy life to this young snowy owl! And so it ends. 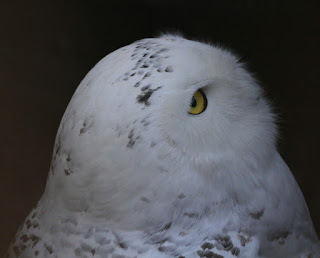 But his story goes on in our imaginations, and perhaps in the binoculars and spotting scopes of lucky birdwatchers who come out expecting a wee red screech-owl and find a big white snow-owl. Of course, I'll be eager for reports from Erie area birders, if any come in; you can contact me on my website, juliezickefoose.com I'd be happy to post any photos. Maybe we can match them to our beloved Owl. You never know. And meanwhile, the work at ACCA never ends. This barred owl was hit by a car, and came in with a badly fractured beak and two broken coracoids. When Katie sent me his intake photo, I wouldn't have given you a nickel for that bird. I couldn't see how he could survive injuries that grievous. Look at him on December 10, less than a month later. Not all ACCA's clients attain celebrity status, but each one is cared for lovingly, fed and treated just that well. I thank Owl for the gift of his presence. I thank him for sweeping me and thousands of others away in the sheer drama and amazement of his story; for showing the cool, slit-eyed face of the Arctic to so many Ohioans and West Virginians who had never seen and may never see such a creature again. I thank him for making his way to the Grand Central Mall to ask for help, if ask he did. 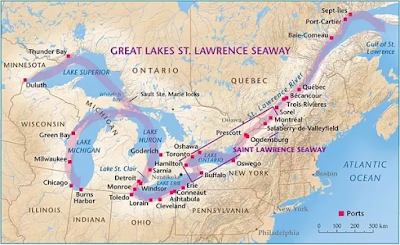 I hope from Presque Isle, he heads west or east then, when the time comes, north and north and still farther north, his strong white wings bearing him with ease, his magnetic sense telling him where home lies. I hope he sees the Land of the Midnight Sun again, where the lemmings swarm and line owl nests with fur and food, swelling small fuzzy owlets' crops with abundance. Most of all, I hope he never has to endure any of this, ever again. I wish him strength and health and joy in flying free again, and I'm certain he feels all that. No creance to bring him up short now. Just air and space, sun and cold, and the promise of going home to the tundra as spring draws near. Fare thee well, Owl! You woke up this morning with a second chance. Two Zick Alerts: I'm speaking about Baby Birds at 1 PM Saturday, Jan. 26, in a Spotlight Presentation at the Space Coast Birding Festival, Eastern FL State College, Titusville, FL. $15.00 Walk-ins welcome! Writing from a small hotel room as we speak. 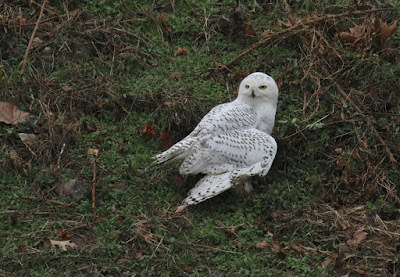 And I'll be telling the story of this valiant snowy owl locally on Feb. 6 in a special presentation to Athens Area Birders. Details on their boffo poster, below. Creance: Fr. A light cord attached to a hawk's leash to prevent its escape during flight training. Have you learned a lot from the Vienna, WV, snowy owl? I sure have. Following this one bird from November 27 to January 20, tracing his movements and the fall and rise of his fortunes, has been a deeply absorbing exercise. From the moment I saw him, I felt a calling to find out all I could about him. And crowding up on the heels of that curiosity came the resolve to help him, because I could see he needed help. The mama lion in me rose up and there were a few people who took offense at my efforts to explain why they should back off and leave him be, but I trust that those who couldn't see the bigger picture at the time see it now. Advocating for wild things is not a popularity contest and lots of times it hurts the heart. My current mantra, and it is a useful one, is, "I don't expect anyone to understand my choices." Nice if they do, but hey. I'm going to do it anyway. But oh, the 99.99% who DO get it, who were right behind the little team of writers and photographers, newscasters and editors, ornithologists, researchers, birdwatchers and most of all wildlife rehabilitators who took this bird literally into their arms and made sure he got care...to you I am indebted. First, let's tell his story, for probably the last time. I realize that I'm behind here. Only two days behind, but in the world of social media, two days is forever. 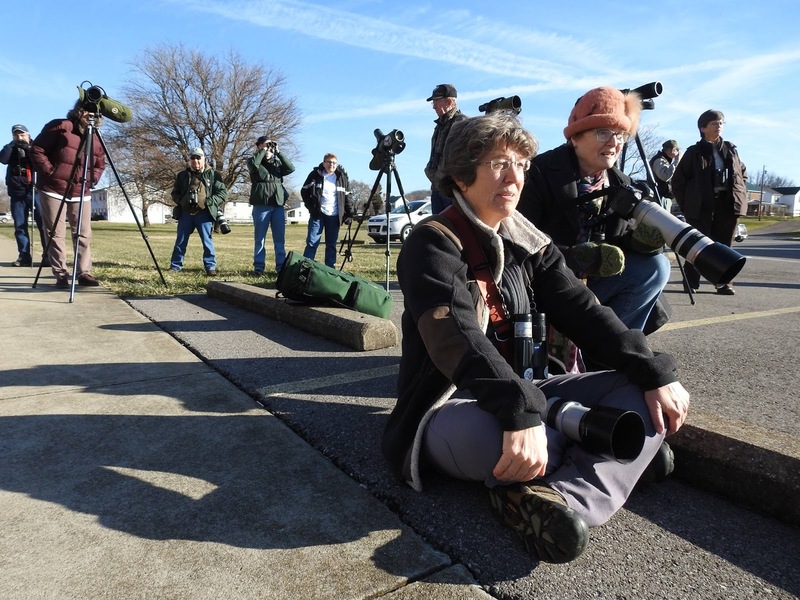 I have been helping kick off an inaugural birding festival (Wings of Winter) in snowy Tennessee, with two all-day field trips and a Saturday keynote. So I'm hoping that you'll enjoy the extra detail and interpretation, if not the timeliness, of the next two posts. I wrote them on my laptop, half closed on tiny plastic trays in tinier planes, with the person in front of me FULLY reclined in both cases. 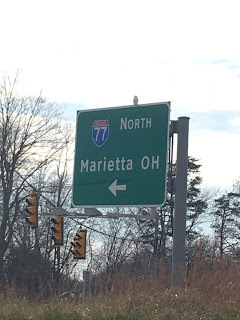 He came to the Marietta Lowe's on November 27, as I was leaving for Ecuador. 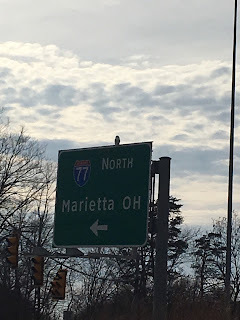 From there, he flew, strong and true, to a highway interchange at Emerson Avenue and I-77, where he decorated the Marietta signs for a week or so, and delighted a lot of birders. 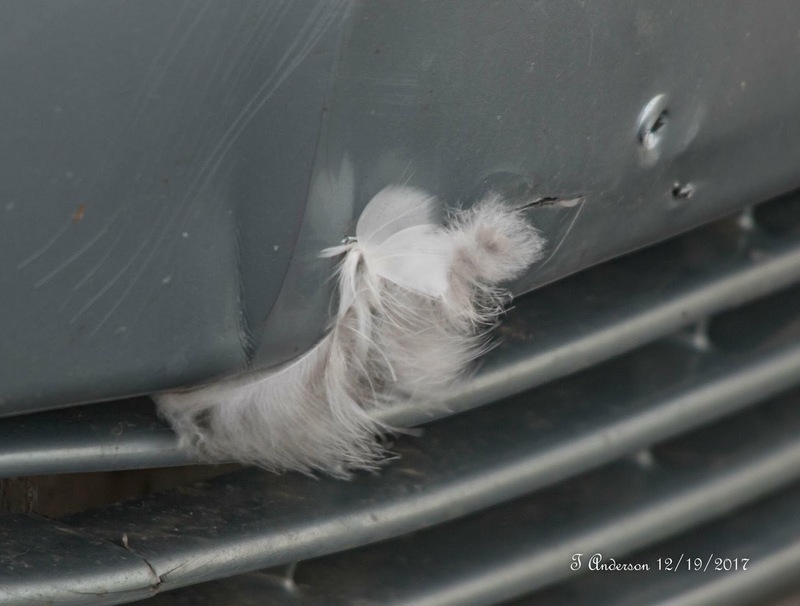 We know by now his story, we know about the cracked car bumper with his feathers tightly caught. We know about the broken coracoid, the aching and unstable shoulder, the weak and uncertain flight that sent him on a death spiral. He was crashing earthward even as he sat in the ditch at Grand Central Mall, and he would certainly have died had he not been captured and taken into care. That spiral ended on December 21, when he flapped gingerly down to live bait on a lawn near Emanuel Baptist Church on 10th St. in Vienna, WV. He was packed in a cardboard box and off to the Avian Conservation Center of Appalachia in Morgantown, WV. There he stayed and recuperated for a month. There he ate, and ate, and ate, his medications injected into rats and quail, so he never knew he was getting them. Except that he felt better and better! I sometimes thought that Emerson would have been a good name for the owl, if I were the sort of blogger who wanted to name him; if he were the kind of owl one would want to name. But for me at least, he wasn't that kind of owl. He had a dignity that was beyond names. Not for him Luna or Yuki or Hedwig. Not for him a name that had been used in a movie, a name that would ever be spoken by the prattling humans far, far below. He was Owl. And little by little his broken shoulder healed and his wing rose up into the right position, until you couldn't tell he'd ever been hit by a car. And this alone is miracle enough for me, that all he needed was abundant good food and shelter and rest, painkillers and antibiotics and antifungals, and his pitifully wasted, weary body kicked in and did the rest. And the time came when Jesse, his avian veterinarian, decided it was time to exercise, time to let this bird fly. His coracoid bone had healed, his shoulder was stable again; he was off pain medications and in good spirits, eating like a hungry horse. The thing about testing a bird's flight capability is do it without letting it go. If it's not yet ready to go, you don't want to lose it to the wild, just as it's about to cross the finish line. So you have two choices. You can test the bird in an enormous run or flight cage, but that may not give you a good indication of his strength. And small wildlife rehab operations usually don't have an enormous, multi-thousand-dollar flight cage. Here at home, with broken songbirds, I will close up a bedroom, or all the doors in the upstairs hall, and see what happens when the bird is set free in those confines. If it circles the ceiling, well, great!! Out it goes into the wild again. If it needs more time and exercise, I set up a nylon screen tent out in the garage, and that becomes its home until it's literally bouncing off the walls. You can't put a snowy owl in a screen tent or a bedroom. They're strong, pointy-tipped and very messy clients. So you fit him out with jesses (leather cuffs) and tie a light cord to them, and you reel him out some slack and run like all hell behind him as he takes off, believing he's free! Free at last! He flew like a bat out of hell. After each flight, Jesse watched him for any hint that his healed coracoid might be hurting him. This would be indicated by the bird's dropping or otherwise favoring the right wing. There was no such message from Owl. In fact, he got stronger with each flight. The keening "spear!" call you're hearing is a ticked off and doubtless territorial red-tailed hawk who takes exception to a giant Arctic owl being flown on a tether in its territory. I thought at first it might have been Owl calling, but Jesse said a redtail was attending the proceedings. Having flown on creance, Owl was a different bird. He was no longer content to while away the hours in his mew, gobbling down good food, preening and dozing. He began to rattle and rumble around in there. He wanted OUT. On Friday, January 19, I got a message from Katie Fallon that Jesse was planning release for January 20. Oh! I was working at the Wings of Winter Birding Festival in Buchanan, Tennessee. There was no way I could make it back for the release. I kind of figured that might happen. You know I'd have been there with falcon bells on! The plan was to drive the owl as far north as possible, to get him as close to normal winter range as we could. 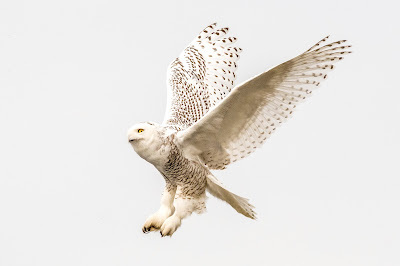 I suggested Presque Isle State Park, four miles outside Erie, PA. Its windswept dunes have hosted many a snowy owl over the years and millennia. Along with securing the necessary permits from the states of West Virginia and Pennsylvania, as well as the U.S Fish and Wildlife Service, it was now time to band Owl, on the slight chance that he might be recaptured or otherwise recovered down the road. 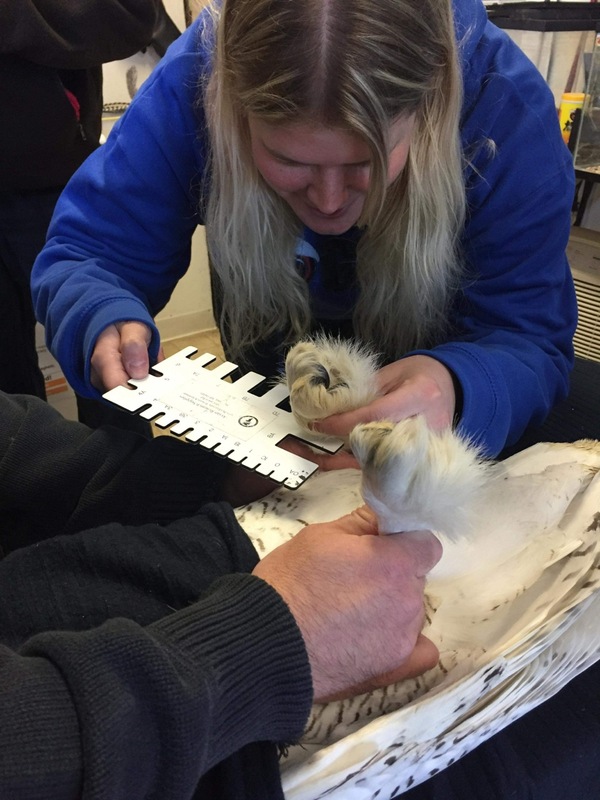 ACCA volunteer supreme Dr. Meghan Jensen, a newly minted expert on the genetics of accipiters and a Swiss Army knife for ACCA, measures the owl's leg, to decide what massive USFWS aluminum band he will require. Meghan is an expert hawk trapper who was very sorry to miss the trapping of this bird. She went on to care for him for a month. Thank you, Meghan!! and gives him a final weighing. Almost 1800 grams, up from 1100! He's edging into female territory, a real bruiser for a male! Oh how I would have loved to sink my fingers into those feathers, to feel his rounded out pectoral muscles. But he wasn't the sort of owl who wanted to be touched. I was pleased to see that only the barest trace of brown staining remained on Owl's right alula. But I still believe he came to the mall for help after his wing was broken. Vince Slabe and Joey Herron, Morgantown owl bander and wildlife photographer, and Jonathan Hall, Asst. Prof. of Geology and Geography from WVU, would accompany Jesse Fallon to Presque Isle in a six-hour man-athon. Then they'd drive right back, high, they hoped, on having experienced a successful release. That story and video is in my next installment. Remember, you're getting slow food here. I'm cooking as fast as I can! 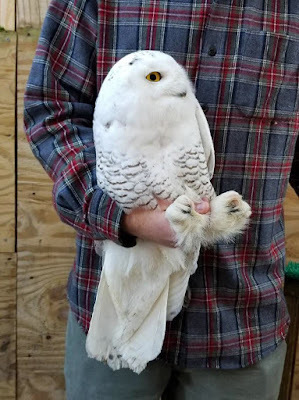 It's hard to believe that the snowy owl captured near the Grand Central Mall in Vienna, WV on Dec. 21 has been in rehab now for almost four weeks. On January 10, our family was invited to visit him in his private quarters at the Avian Conservation Center of Appalachia in Morgantown, WV, about a three hour drive from us. For obvious reasons, wild birds being rehabilitated for release are not on public display, so being permitted to visit him was a special privilege, earned by telling his incredible story in my last eight blogposts. As always, I was delighted to be your eyes and ears. And thank you, thank you for your generosity toward ACCA. It was SO GOOD to see him again! I wondered if he recognized me. Hee hee. He doesn't look thrilled to see me in the least. He looked like an utterly different bird from the sad little wreck I last saw on a telephone pole near Faith Baptist Church, sitting with eyes closed for over six hours, hanging his aching wing straight down. Look at that right wing carriage now! It's up in a normal position; it's not resting on the perch, and it's even slightly tucked into his breast feathers! And look at that nasty glare! I love a nasty glare! These are the things that make a bird rehabilitator's heart sing. Because the owl's coracoid fracture was minimally displaced, meaning the bone ends were in essentially the right position to knit, avian veterinarian Jesse Fallon elected not to wrap the owl's wing. He was kept in a small enclosure for the first two weeks so he wouldn't need to fly at all, then moved to this roomy mew (falconer's term for a wooden stall for housing raptors). Here, he can fly from low perches to higher ones. I brought my telephoto lens, shooting as best I could through the latticework privacy wall. I thought you'd appreciate the detail of his feather moustache and his golden eye. Please click on the photos to enlarge them! There's that right wing, nicely tucked in. Compare with how he was carrying it on Dec. 22, the day after he was brought in to the clinic. This poor bird had been forced to fly on a broken coracoid since he was hit by a car on December 6. If he didn't fly, he couldn't hunt. If he couldn't hunt, he didn't eat. The flesh dropped off his bones, and he got weaker and weaker. He was on a downhill spiral and near death when Jesse dropped the pole net over him on 10th Street, Vienna, on Dec. 21. The owl is no longer near death. He's full of beans. He's back, and big as life. He's rarin' to go! I caught him dining on quail near the end of our brief visit January 10. I like how he pulls his snow white moustache back to eat. But it was this video from Katie Fallon, sent on January 13, that really thrilled me. He's so alert, so alive, so present. He knows the sound of the door latch means a mouse, rat, or chick will appear. And he's serious about getting to fighting and flying weight. This owl won't be captive for much longer: two weeks at the longest, by Jesse's estimate. We felt lucky and blessed to be able to pay him a visit. It was the dessert on a wonderful day spent in a personal guided tour of West Virginia University. We were impressed. We were excited. We liked the art department as well as any we have visited, and the instructors couldn't have been nicer or more welcoming. 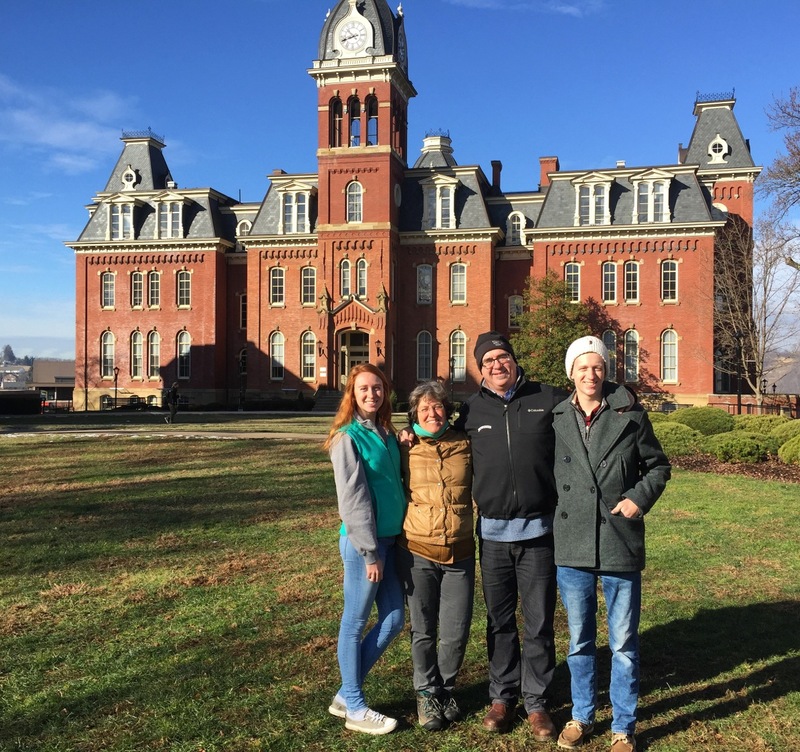 James Froemel, Recruitment Specialist for WVU's College of Creative Arts, took us on a grand tour of the Creative Arts Center, which is housed in a huge mostly round building designed to look like a film projector. I've never seen Liam light up like he did when we poked our heads in Mary McClung's office. She's Professor of Costume Design. She makes these things. And we could see that Liam suddenly wanted to make them, too. 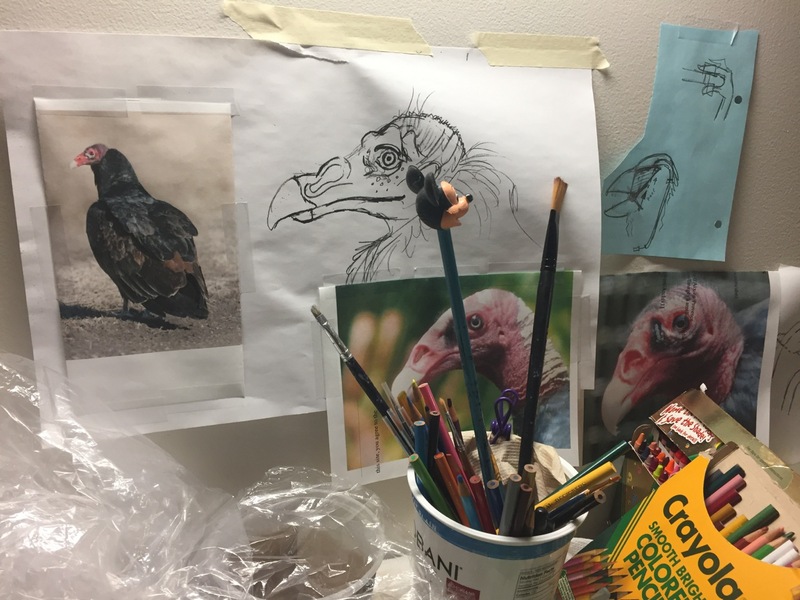 I had to take it as a powerful sign that my totem bird, the turkey vulture, was featured on the wall. When I asked Dr. McClung about it, she said she wanted to make a vulture puppet for fun. Because they're cool. 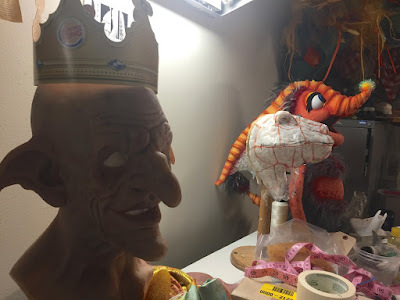 I showed Katie Fallon this photo when we visited ACCA, and she smiled as big as I did. Katie's the author of Vulture: The Private Life of an Unloved Bird. I'm reading it right now and loving it. WVU is the only university to offer a degree in puppetry. Well. Who knew? The world is out there waiting for Liam. He also lit up bigtime when we entered the printmaking classroom. He ran up and scrutinized the student work on the walls and I could see there was printmaking in his immediate future. What a thrill!! 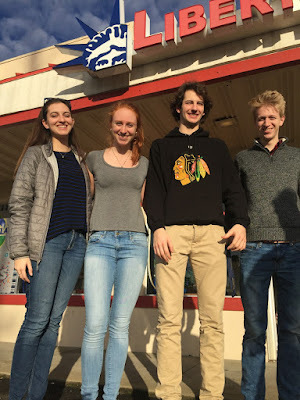 We had lunch and gelato with our favorite West Virginia comets, the Heeter kids. Regulars at the New River Birding and Nature Festival have watched them grow up, for their father Geoff Heeter is one of the prime movers behind the festival. 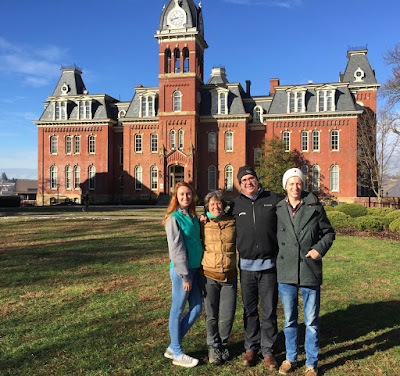 Both now attend WVU, and they love it. Our kids are close, and nothing brings us parents more joy than watching them together. Giants, all, dwarfing their parents. What the heck?! What a nice crop of beautiful human beings. It was a most wonderful day. It made me reminisce about our first college hunting experience. I couldn't remember even having to think about application deadlines, essays or scholarship applications, much less freak out about them. That first little bird kinda flew right out of the box. I don't remember having to shake the cage at all. Launching our second human has been a hugely absorbing pursuit, but worth every second of cheering, pushing, cajoling and challenging. Seeing him connect with a place is such a thrill. He's gotten in everywhere he's applied. Now it will come down to what he most wants, and what we can afford. Photo by Sue Dougherty, DVM, Bend, Oregon. Lifted off the net, where it's viral. Hope that's OK.
Liam will fly, just like the Vienna Owl will. Stay tuned. 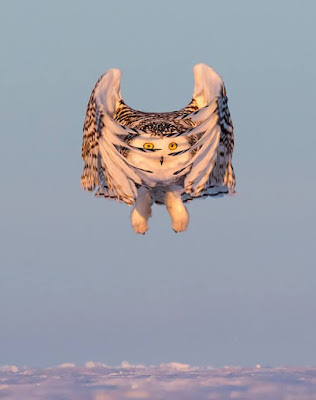 So I ask again: Is it asking too much of the human imagination to think that a snowy owl that experiences pain on flying knows it’s in deep trouble? If the answer to that is no, then this: Is it not possible for an owl in trouble to deliberately make its way to a place where humans couldn’t fail to find it, and wait for help? If the anecdotes cited in my last post are to be believed, this kind of self-awareness is within the mental capacity of a turkey vulture and a cottontail rabbit. If a scavenger and a “lowly” herbivore like a rabbit can make the connection, what about an apex predator, which relies on cunning and innovation to catch its prey? When I think about it in this outside-the-envelope way, so much suddenly makes sense. 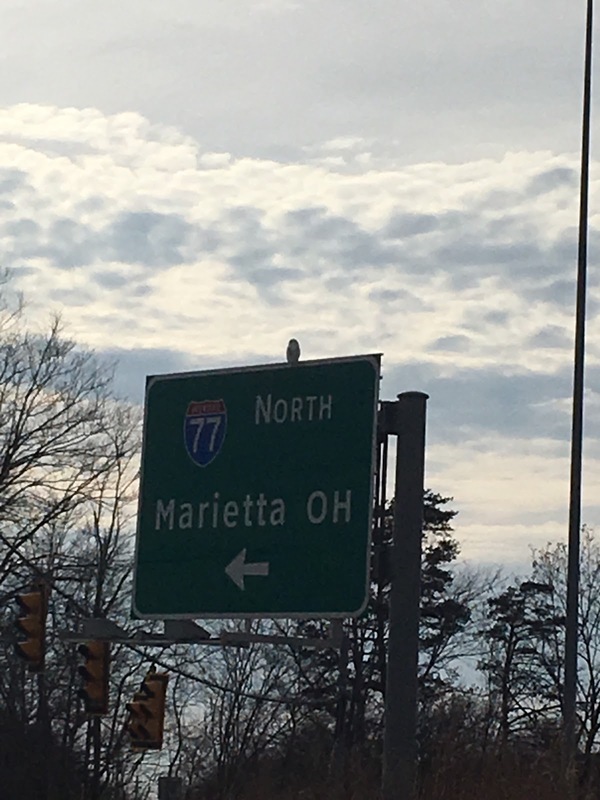 This owl, which had formerly shown a predilection for sitting on highway signs, now stays huddled on the ground. It can still fly well enough to get to the top of a tree or building, but on the ground it stays. It sits still when people gather nearby. I was told that people were trying to get close enough to pet it, and that, a couple of days after it appeared at the mall, two men approached it with a blanket and a box in an attempt to capture it. They were stopped by the manager of a nearby restaurant, who was suspicious of their intentions. It leaves at night to hunt, but spends its days in this most unlikely ditch, enduring the attention of hundreds of people, a crowd that grows with each passing day. Was the owl waiting for someone to notice that its wing was out of place; that it flew with difficulty? So many people told me, again and again, "When it flew, it flew fine! It looked strong!" I didn't see that. I saw a bird in distress. And this is where it gets really interesting. I photographed the owl all Monday afternoon, Dec. 18, until dark. In between shooting, I tried to keep people away from it, with varying success. 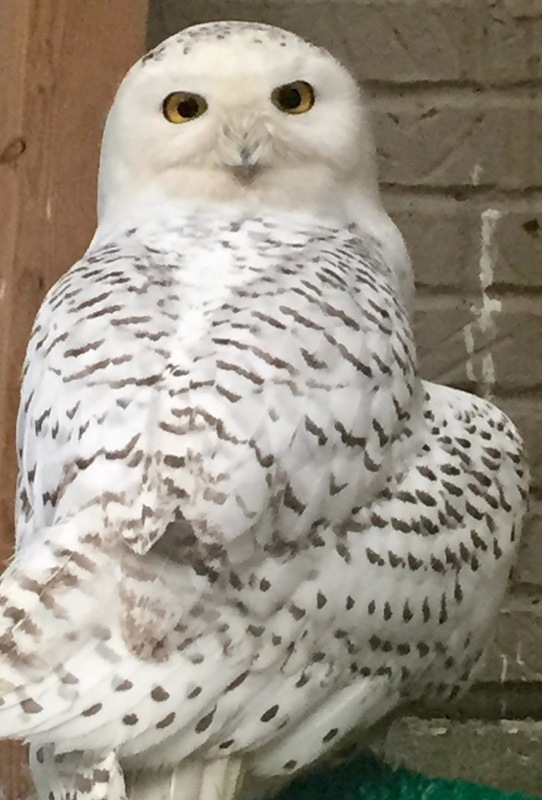 Most complied, but some ignored my entreaties, in the quest for the perfect cellphone photo of the “tame” Harry Potter owl. I left the mall dispirited and completely exhausted, too tired to even upload my photos. But I woke at 6 the next morning and dove into it like a creature possessed. I wrote from 7 to 4, not stopping for lunch. I wrote a post about the owl, about the stress put on it by the ever-growing crowds; about its mysterious injury. I didn’t know then that it had been hit by a car, but I knew it was badly compromised, and I sensed it was going to die unless I did something. 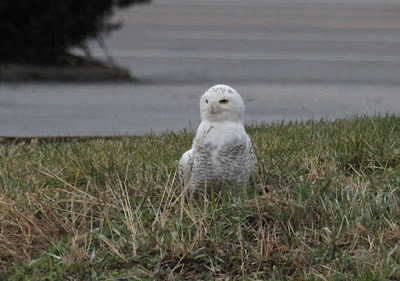 I posted “The Parkersburg Snowy Owl” on my blog around 4:30 pm Dec. 19. The post went crazily viral, with more than 44,000 views in less than two weeks. And the spinning wheels, a bunch of concerned people fighting a mostly losing battle for public consideration for this bird, got traction and started rolling. Several more days passed while a concerned group of people, including State Ornithologist Rich Bailey, Rebecca Young from USFWS, Katie and Jesse Fallon from the Avian Conservation Center of Appalachia, raptor biologist Vince Slabe, Bill Thompson III from Bird Watcher’s Digest, Jon Benedetti of Mountwood Bird Club, bird bander Joey Herron and I all quietly conferred about how best to help the bird. We knew it should be trapped and taken into care. We had to keep the plan quiet, anticipating that trapping the bird in a public place would be difficult enough without a bunch of people gathering around. The owl showed up at the mall each day, and crowds only grew. Finally, December 21 arrived. We’d all agreed to converge at the mall at 10 AM to attempt to trap the bird and take it into care. Two local police officers were invited for crowd control. As I was loading the car that morning, I got text messages from Katie Fallon of ACCA, and an email from Jon Benedetti, who had been watching over the owl and educating the crowd at the mall since Dec. 14. Jon was at the mall, but the owl was nowhere to be found. I was befuddled. How far could it go with that injured wing? And where would it have gone? Only a few minutes later, Katie texted again. Local birders Kyle Carlsen and Mollee Brown had located the owl about ¾ mi. from the mall, atop a building just behind Faith Baptist Church on 10th St. in Vienna. What luck! 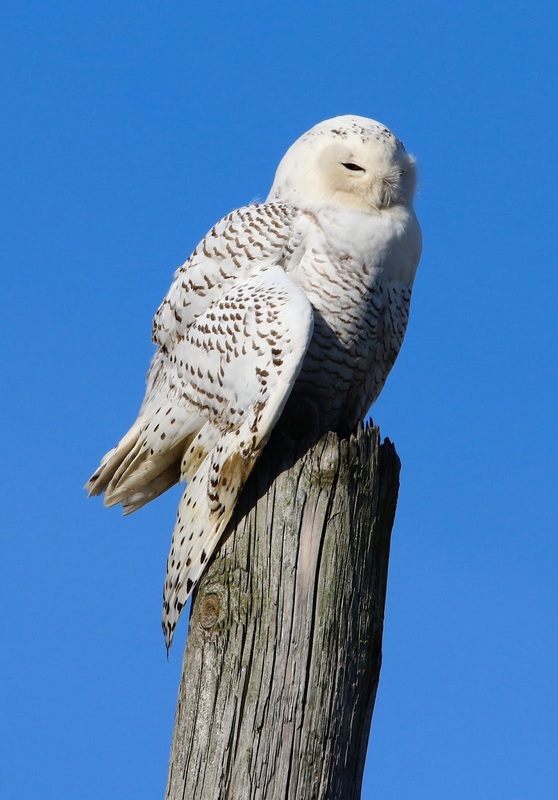 When Jesse and Vince arrived there around 8:30, the owl was gone, but it turned up on a telephone pole a few blocks away, gleaming bright white in the winter sun. We trained our binoculars and scopes on it, wanting to give it space so that Vince could set his bow net and possibly capture it. And we who had been following this bird with such hope and determination were heartsick to see its right wing hanging straight down from its side, fully extended. The owl sat there in the bright sun for a long time: 6 ½ hours, to be exact, while we watched and waited. It never moved from the telephone pole. People drove up, snapped photos, and drove away. It was hard to miss; you could see it shining white from Grand Central Avenue. I moved closer and parked several hundred feet away to observe and photograph the bird from my car window. All day long, it never once tucked the injured wing up. It would twitch the wing as if thinking about drawing it into a normal position, but never did. The longer I watched it and thought about it, the more I wondered about why, on this day of all days, the owl had quit the mall. 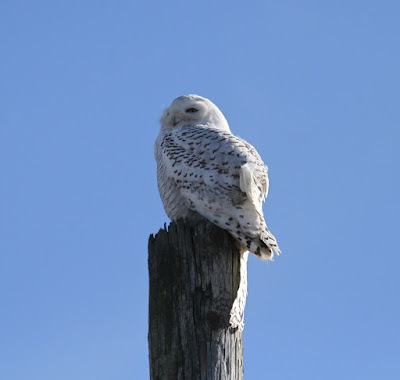 Why it chose to perch atop a telephone pole on a quiet back street. Why it stayed there for so long with its injured wing fully extended. I wondered if the owl had gotten the message from us that things had changed; that it was about to be captured. This message could not have come in spoken word; rather it would have come in the mind pictures we who were most closely involved with it may have inadvertently sent it. That animals think in pictures, and likely convey information to each other through a kind of pictorial telepathy, is likely. One has only to read Temple Grandin’s writing (Thinking in Pictures is a favorite book) to know this. 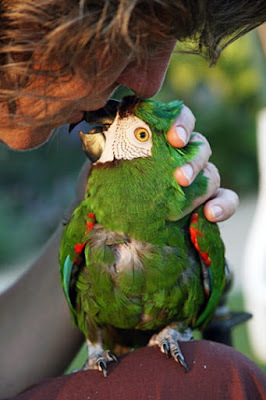 One has only to live with an animal or bird to know this. I could bring Chet Baker yawning and stretching out of a sound sleep in another room by visualizing a fun run with him. In a far freakier feat, I once brought him slinking back from chasing cattle with a mind-picture I didn't even mean to send. 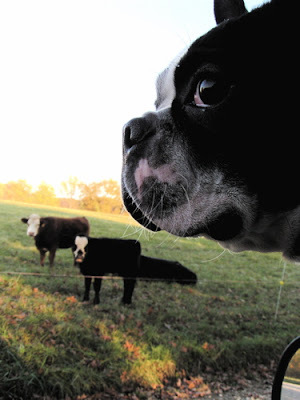 As a crazy pup, he'd ducked under a barbed-wire fence and run straight into a herd of cows with spring calves. I had run after him, calling his name, until I couldn’t run any farther. He was having so much fun nipping the heels of the cattle that he’d ignored my screams. In despair, I sank to the ground, and a picture flooded my mind of his dear little round head, kicked in. And even as a heedless pup, Chet couldn’t ignore that horrific image that made its way from my vivid mind to his. And he stopped what he was doing, ran back to me and crawled into my lap. 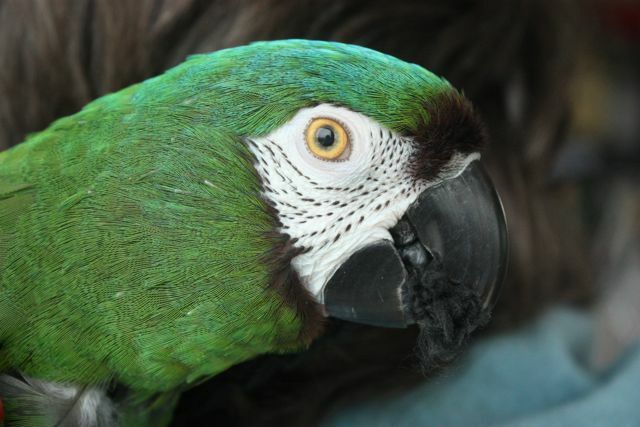 My macaw always seemed to know when I was about to clip her toenails, a procedure she detested, well before I fetched the towel and clippers. She’d begin to tremble and move away from me. It was the darndest thing-- as if she was reading my mind. Well, she was! I became convinced she was able to see the pictures in my mind as I planned my strategy to corner her. Toward the end of her 23-year life, I would pay her the courtesy of announcing it to her, to save us both the trouble of her waddling and flapping away in dread. “Charlie, as you know, I’m going to have to clip your nails today. I’m sorry. I know you hate this.” She’d step onto my hand, allow me to walk with her to the linen closet, grab a towel and spread it on the floor. I’d then lay her down gently on her back and swaddle her in the cloth without a squawk of protest. We had reached an understanding. Charlie didn’t like being surprised by a sudden mind-picture, but was amenable to being asked nicely to cooperate. We both knew, after 23 years, the nail clip was going to happen whether she fought it or not. If this is what people call “animal whispering,” all right. I don’t use the term. I don't use "furbabies," either. Animals are other nations, in harmony with us if we take the time and make ourselves still enough to receive their thoughts, their hopes, the pictures in their minds. I believe that we communicate wordlessly with animals, and they with us, all the time, but most of us aren’t “woke” enough to acknowledge that it’s happening. So here’s the owl, and let’s let our skepticism go long enough to consider that it has been reporting to the crowded mall every day for eight days in hope that someone will be able to help it. 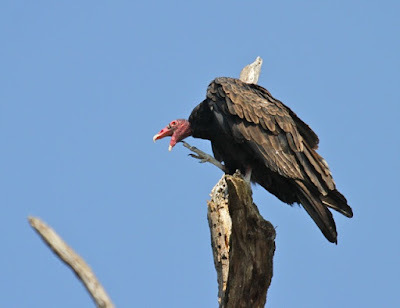 The way a turkey vulture hopes. 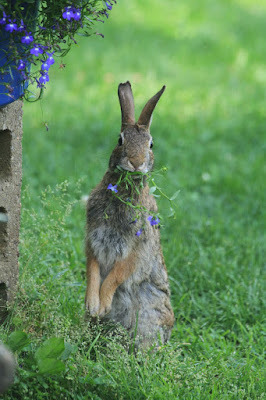 The way a cottontail hopes. Hoping, in a way most of us can’t even grant it the intelligence and presence of mind to do. And nobody seems to get it. Nothing happens. It goes on trying to hunt at night, starving and getting weaker by the day. And that wing hurts. So the owl knows that plan isn’t working and it’s not stupid, nor is it crazy. It’s not going to keep doing the same thing over and over, expecting a different result. On the ninth day it gives up. It quits the crowded mall and struggles to the top of a telephone pole in a quiet neighborhood. And it lets its hurt wing hang straight down there in the bright winter sun. Even the least observant person walking by might say, “Hmm. 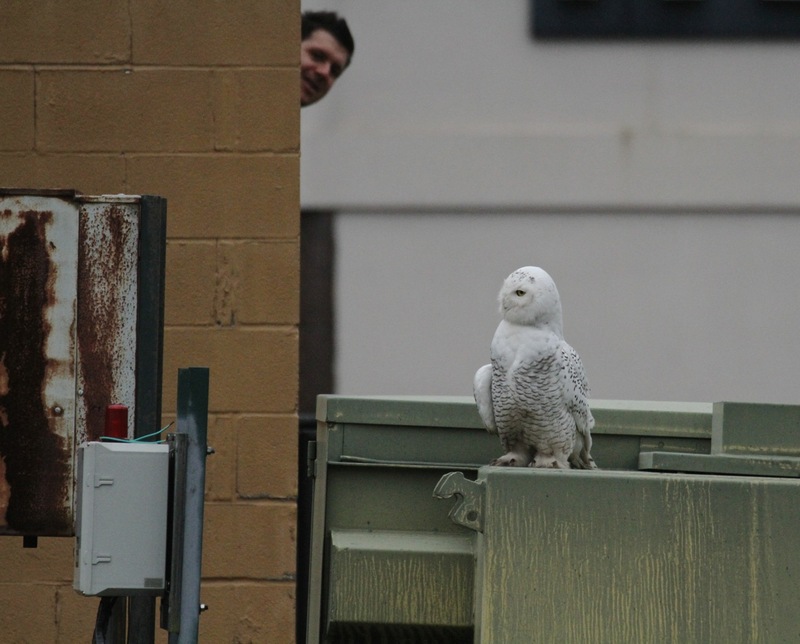 Look at that big white owl there. I wonder why its wing is hanging down like that?” I think about that 6 ½ hours of pole sitting differently, having entertained the possibility that the owl knows it’s injured and might be seeking help. I wonder if it’s a silent advertisement, a protest of sorts. Here I am. My wing is hurt. Anyone picking up on that? And the owl looks down and there’s a gerbil wiggling around in the grass. An easy mark. It stares at it off and on for six hours, and finally takes the suggestion we’ve made that it come to us for help. I’m not going to imagine the owl knew there was a trap set for it and had to decide whether or not to take the bait. 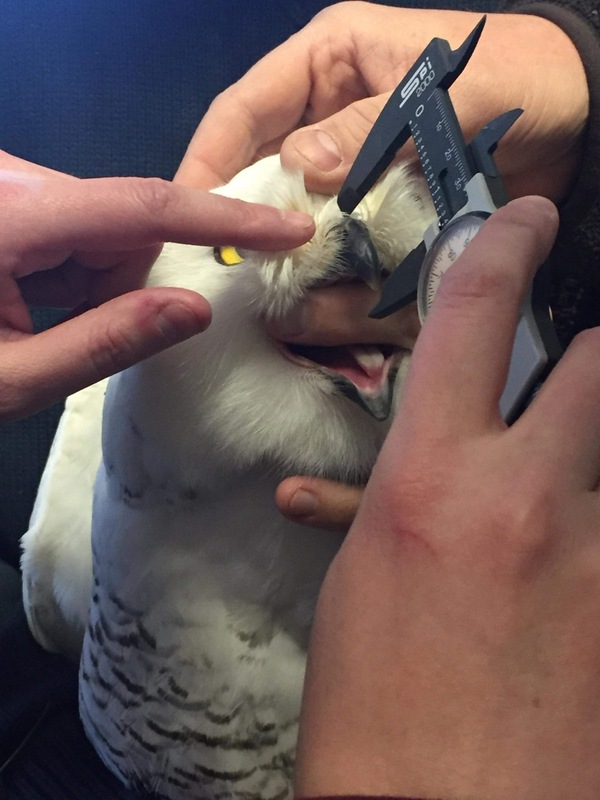 But I do wonder if it got our mind pictures of checking it out, feeding it while its coracoid heals; pictures of it spending time in rehab and then flying back free to the Arctic? Did it get the transmissions we were all unconsciously sending it? Maybe my head’s gone soft. Or maybe something really special was passed between a young snowy owl and the hopeful humans gathered on 10th Street, behind the Faith Baptist Church, on the Winter Solstice. I simply cannot dismiss the possibility that the owl came to the Grand Central Mall, weird place of all weird places for an Arctic owl to appear, to get help. I believe that sitting on the ground at a crowded mall with your wing crumpled and hanging down wasn’t as dumb a move as all the humans thought. I rather think that we’re the dumb ones, for taking eight days to figure out what the owl was trying to tell us. On the ninth day, he rested, up atop a telephone pole for all to see. 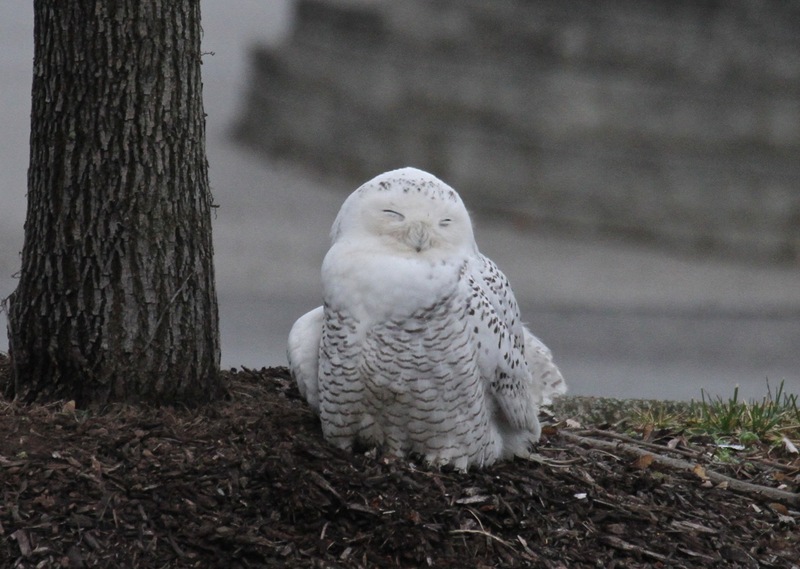 And on December 21, as the longest night of the year came on, we finally got the snow owl’s drift. As a storyteller, I like the way this ends. However. I know you are dying to hear some fresh news on the owl. Hey, me too! 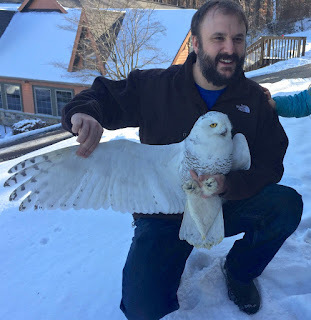 Katie Fallon (author of Vulture and Cerulean Blues, and my owl information connection, has been doing a writing residency and has been away from home, hearth, kids, husband and owl. She checked in this afternoon with this update! January 7, 2018, 1:30 pm. 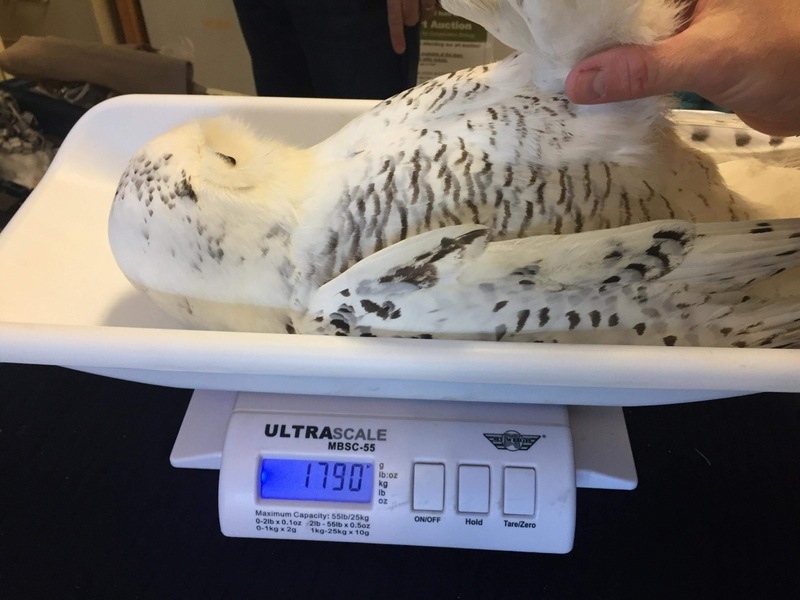 Jesse and Katie Fallon report that the owl weighed a (low-end but normal) 1500 gm before his meal today. The coracoid fracture has healed. His shoulder is stable. He's done with his antibiotics and is off pain medications. Still on an antifungal, just to protect against infection. Jesse has moved him to a larger enclosure today so he can exercise at long last. The owl feels strong! Blubbering? Me, too. Thank you for following his story, thank you for caring, and thank you for remembering the Avian Conservation Center of Appalachia in your generosity. 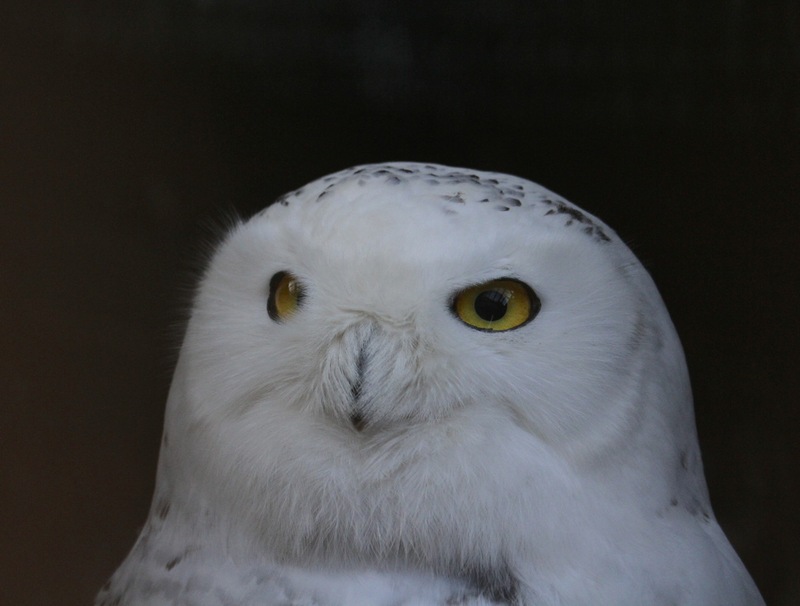 And don't forget Project SNOWstorm, which is shining a great light on the hidden lives of snowy owls. Each individual is precious, and has so much to teach us, if we will only listen. A bigger enclosure? Show it to me! Also: Put me down. And lunch. Now. 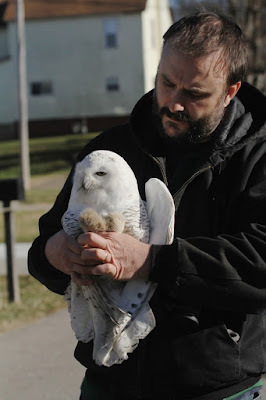 Let’s consider the journey of this young, naïve owl from the Arctic Circle to Parkersburg/Vienna, West Virginia. What can he know of humans? What can he know of power lines, highways, fast-food restaurants and speeding cars? He may not have even seen a tree before he started his journey. He’s a blank slate. 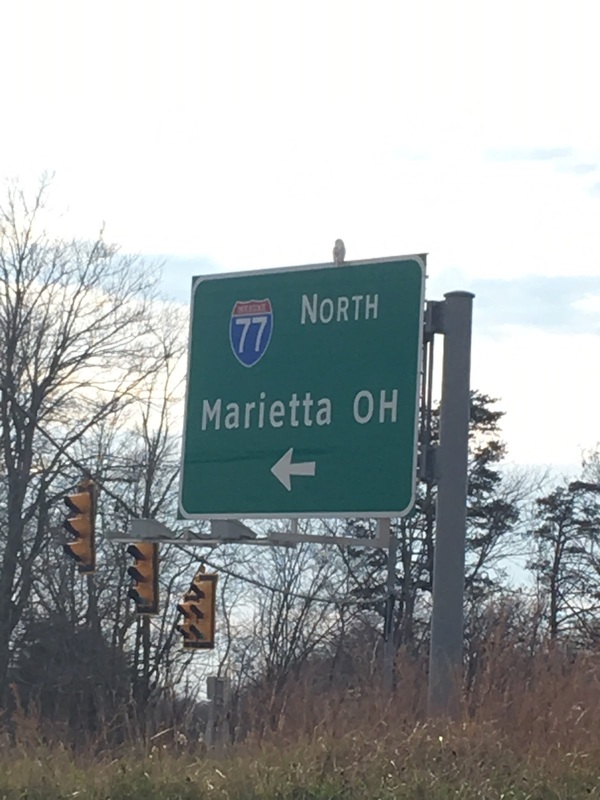 For whatever reason, he ends up sitting on signs at the intersection of I-77 and Emerson Avenue. Sometimes he lands on the road and sits there for a while. He’s finding mice and voles, maybe the occasional rat. On December 6, he launches off a low wall in front of the Burger King and flies into the right front bumper of a beat-up silver car. The driver, a kind man with a gray ponytail hanging down the middle of his back, is horrified. The impact was hard, enough to embed white flank feathers so firmly in his cracked bumper that he can’t pull them out. He thinks he’s killed the bird. But the owl flops off and, as far as I have heard, no one sees or photographs it again for eight days, until December 14, when it turns up in a creek bed that runs through an inland sea of asphalt at the Grand Central Mall. The old TV and newspaper ads for the mall said, “Grand Central Mall, where time doesn’t matter at all.” I always wondered if that slogan left anyone else spooked. I’ve been thinking about this owl ever since I saw it for the first time at the mall on December 19. I’d tried for it once before on December 12, back at the highway exit, but couldn’t find it. I didn’t know then that it had already been hurt and vanished from view. I’ve reconstructed the chain of events presented here from my conversations with other birders and owl watchers. I’ve been thinking about why that owl flew, injured as it was, four miles from the highway interchange down into the heavily developed plastic strip of Emerson and Grand Central Avenues, leading up to the mall. Why it ended up, on Dec. 14, in the absolute center of human abundance, and settled there. Why it seemed oddly content to be ringed by people all day long for a week running. Why it sometimes flew away from one person and right up to another and sat on the ground at their feet, so tame, so otherworldly calm and seemingly trusting. There are any number of places one could go on such a train of thought. First, we can dispel any notion that the owl is, in fact, tame. 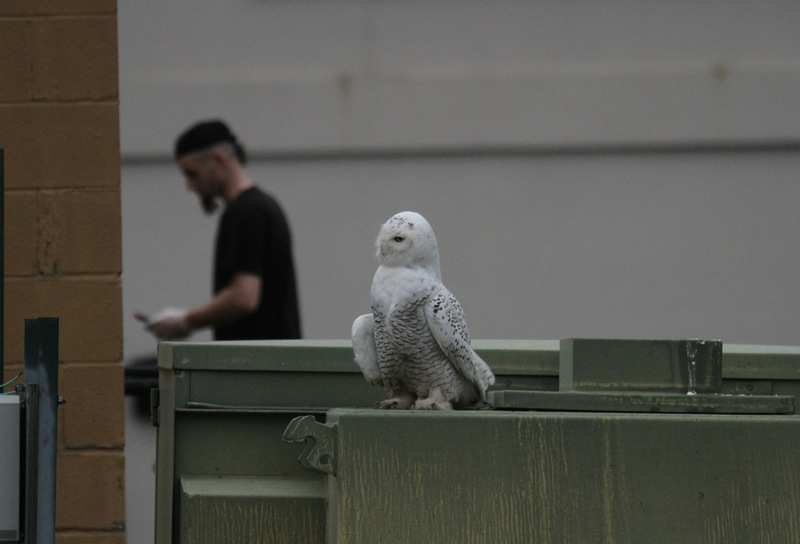 Nobody keeps snowy owls; they don’t escape from captivity and wind up in shopping malls. It’s inarguably wild, part of an invasion of mostly sub-adult birds following a great lemming year on the tundra. More lemmings means more food for baby owls, and more owls live to fledge and fly south the following winter. More to the point, however, we’ve established that it got hurt before it turned up at the mall. 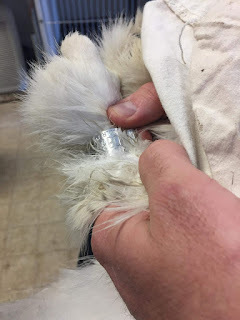 The owl’s been diagnosed with a broken coracoid on the right side of his breastbone, and instability in his right shoulder joint, making for weak and undoubtedly painful flight. The more I think about the way things rolled out for this owl, and the way he behaved the day I hunkered down for six hours and watched him interact with the crowd that gathered at the mall, the more I think he was there for a reason. I think he may have come there, looking for help. I know this will sound preposterous to most, and I don’t care. I didn’t make this notion up. It presented itself to me. 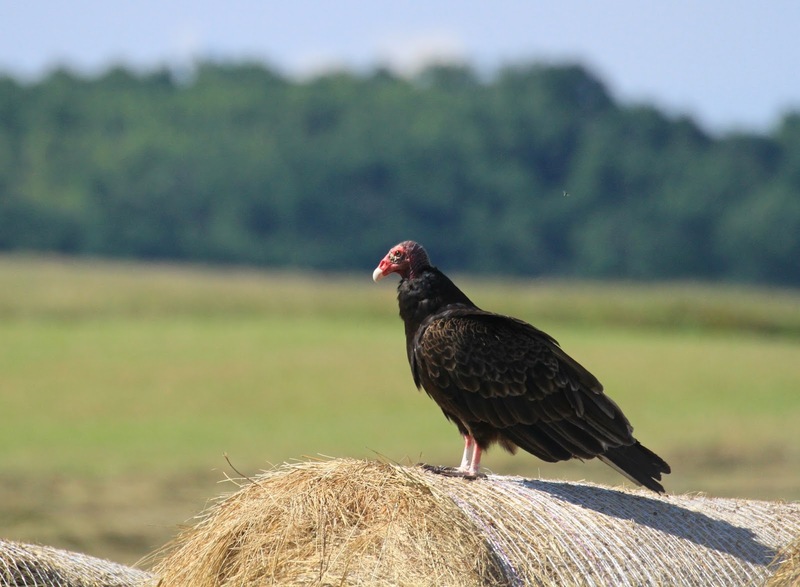 I’m remembering a story my trusted birder friend Charlie Kennedy told me, about a turkey vulture who was hit on the road in front of his rural Alabama home. How, after the screech of brakes, a newly busted vulture came walking up Charlie’s driveway, dragging one wing, and kept walking, right up to Charlie. It looked up at him silently. “Go on into the woods, old son. You’re done for. There’s nothing I can do for you,” Charlie said, and turned to go get a shovel out of his toolsheld. When he came out, he nearly tripped over the vulture, which had followed him into the shed. Later, It followed him up the steps to the kitchen, still dragging its wing. It had no hope of flying away. It undoubtedly knew its life as a creature of the air was over. Its choice was to die slowly in the woods, or seek help. Charlie finally called a wildlife rehab clinic and took the vulture there, where, sadly, it died sometime later. I can’t get Charlie’s story out of my head. I had a similar experience with a turkey vulture that I found standing by a busy road, its head hanging low. I stopped, knelt beside it and asked, “What’s wrong, honey?” The vulture didn’t flinch; it just rolled its eye at me. Gently, I gathered the big bird into my arms and it rode home on my lap. It was starving and covered with louseflies, but not a bone was broken. It hadn't been hit by a car--there were no injuries anywhere. Oddly, the bird ignored the food I laid out for it, but would eagerly eat chicken livers and stew beef from my hand. We drove it to the Ohio Wildlife Center, the smell of vulture vomit rich in the van, and even they couldn’t find anything wrong with it, other than emaciation and parasites. After an uneventful recovery, it was released to fly again. I have no explanation for its behavior other than that it knew it needed help, and waited by the roadside for someone to stop. I’m glad that person was me. I have been collecting stories like this for years. I’ve got more from my friend Christine Carpenter in Pennsylvania, about three wild cottontail rabbits, badly infested with warble fly larvae, that allowed her to help them. Warble flies lay their eggs on rabbits, and large maggots make huge, painful lumps under the skin of cottontails. The animals lose condition quickly. 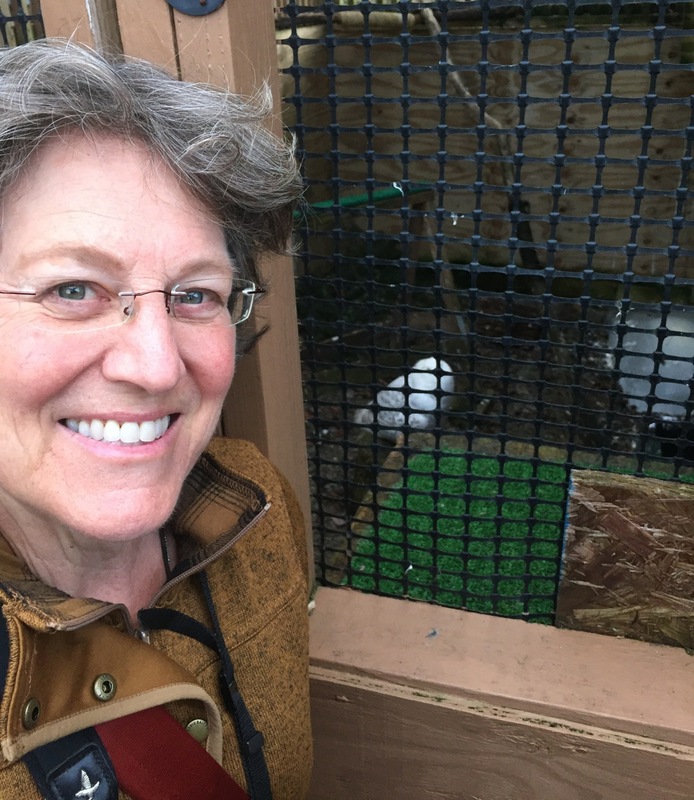 Christine found the first rabbit lying, seemingly near death, under a cherry tree. She took it in, and with her husband, Dan Nageotte, helping her hold it, removed the larvae. They left it lying on towels in the bathtub for the night, fully expecting to find it dead in the morning. Instead, it was strong and wild and they caught it and released it immediately. Over the next week, two more wild rabbits, similarly infested, approached Christine and allowed her husband to hold them so she could cut the larvae out of their skins. 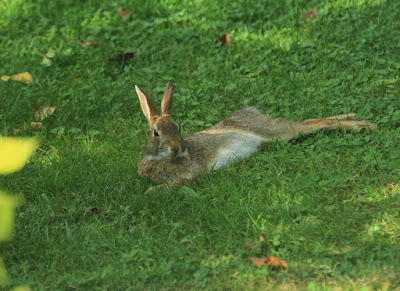 What would make wild rabbits approach a person? Misery, apparently. And, the possibility, I’d submit, of an understanding of their good intent, transmitted somehow by the rabbit that had been rescued. More on that later. 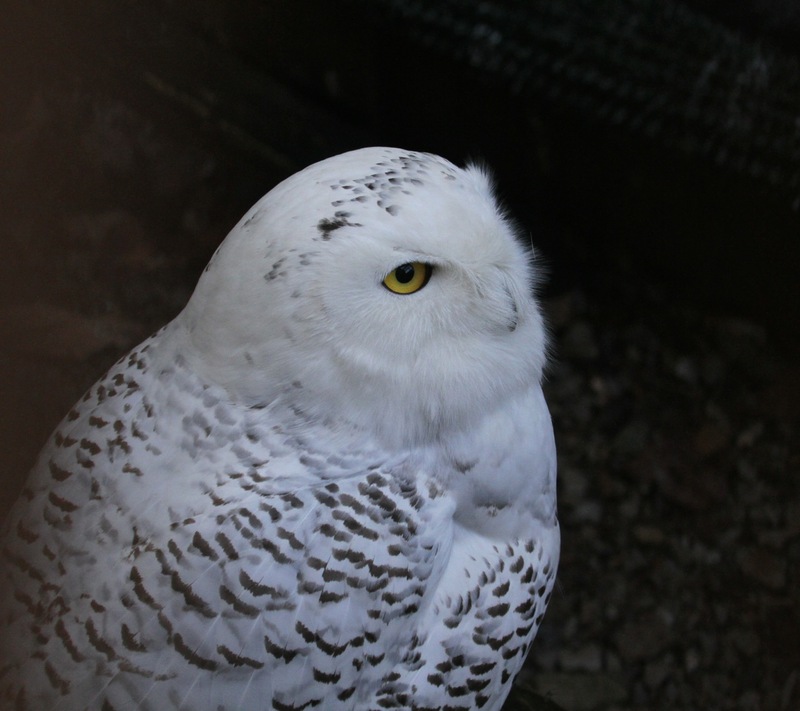 Snowy owls have lived to age 28 in captivity, and there’s no reason to assume they couldn’t live at least that long in the wild. Longevity is directly related to intelligence in birds and many other creatures. 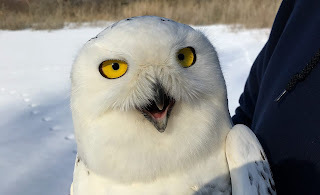 We are in the earliest stages of finding out what snowy owls are all about, thanks to the astounding geotransmitter tracking studies of Project SNOWstorm, which was opportunistically launched during the last huge owl irruption in 2013-2014. Solar-powered transmitters in small, 40 gm. backpacks fitted onto owls collect information on latitude, longitude, flight speed and air temperature. While the owls spend most of their lives out of cell signal range, the transmitters can store months or even years of information, which will all download when the bird next flies into range of a cell tower. Project SNOWstorm’s findings are profound; they are new; they are extraordinarily detailed, and through them we’re learning things about snowy owls that we could find out in no other way. 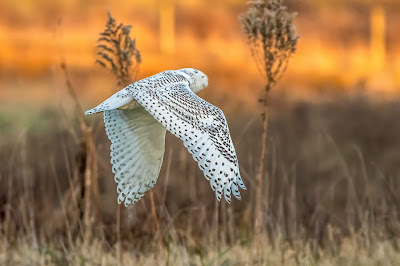 Long thought to be diurnal, I suppose because they perch in the open where we can see them sleeping, snowy owls are now known to come alive at dusk and hunt all night. They transform from slit-eyed sleepy lumps to ferocious talon launchers of death. 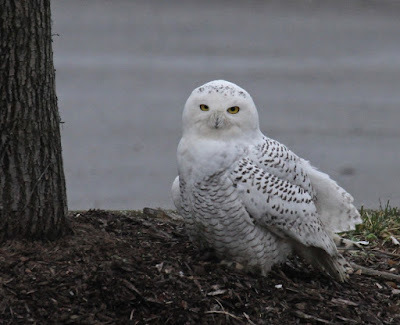 Some snowy owls winter on the Great Lakes ice for weeks or months at a time, feeding on sea ducks, geese, grebes and gulls—even hapless herons! Check out Project SNOWstorm's latest blogpost about that here. The project has documented snowy owls flying out to hunt on the open ocean, perching on ice floes, channel markers and buoys. I’m having to rein in my use of exclamation points here. 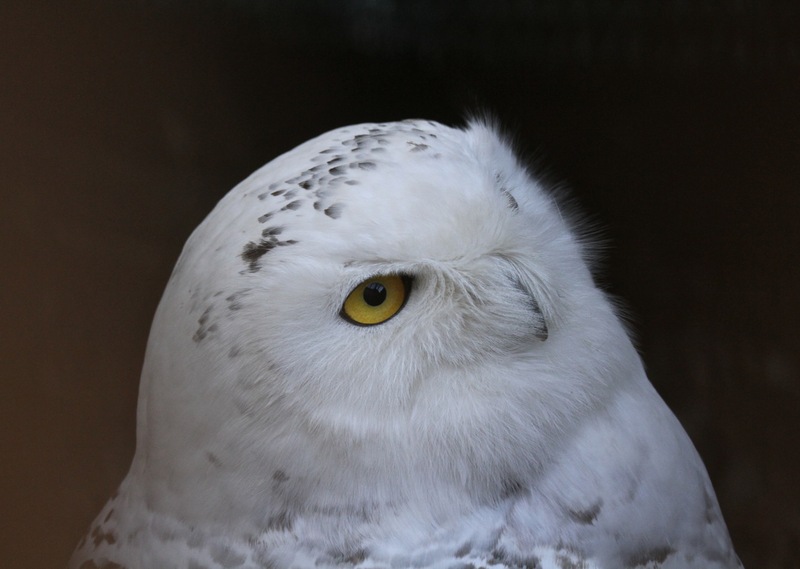 Thanks to Project SNOWstorm's geotransmitters, we can see where individual owls go to nest, and the type and frequency of movements they make while tending eggs and young. More than 50 individual owls have been tagged, at a cost of around $3,000 per backpack, which sounds terribly expensive, but oh! the things we’re finding out about snowy owls! I can’t think of a more elegant and unobtrusive way to learn about a bird than to follow its every movement throughout its life. Compare that cost to that of the space program, and it’s a pittance for what we’re learning about the world’s most magnificent owl. One of the sad things we’ve learned is that estimates for their total population, once put at 300,000, based on the estimated carrying capacity of available habitat, were off by an order of ten. 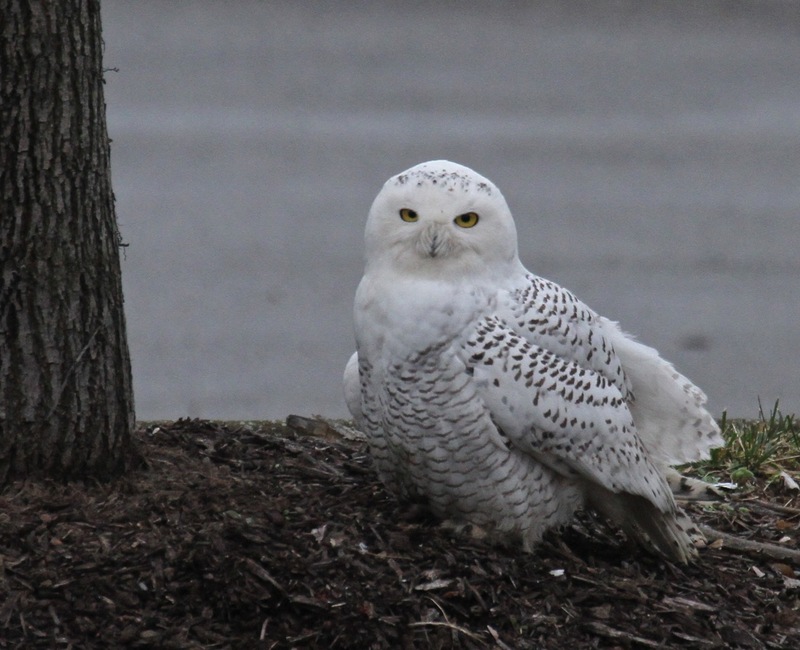 We now believe that no more than 30,000 snowy owls exist on earth. They’re on the IUCN Red List now, and are completely gone as breeders from Greenland. Nobody’s sure why, but the gaunt forms of starving polar bears toll a mournful bell that all is not well in the Arctic. 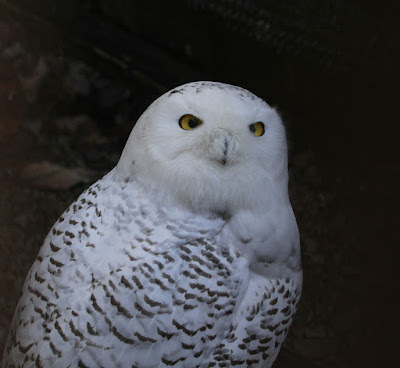 And each snowy owl is even more precious now. What I’m getting at, in a roundabout way, is that our knowledge of snowy owls is so very rudimentary. We’re learning a great deal now about what they do, but what do we know about what they think and feel? It’s clear that there is a lot more going on with snowy owls (and, to name two, rabbits and turkey vultures) than we could have ever suspected. The owls’ individual differences in movements (some are homebodies; others travel more than 2,000 miles in a year); their individual predilections for certain types of prey, from voles to gulls to geese; their endlessly varied and creative use of habitat, from hunting rodents in cornfields to taking sleeping ducks at night from a bobbing buoy on the open sea, all point to a long-lived, resourceful, individualistic and highly intelligent creature. 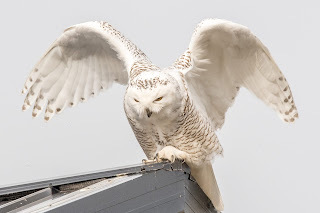 In my next post, I'll expand on these thoughts as they apply to the Vienna snowy owl. I hesitated to go see it, because I knew I'd get involved. I couldn't have known how deeply involved. But I'm grateful to this bird for opening some doors in my head, doors that open into his. Many, many thanks to my story donors, Charlie Kennedy of the Alabama Ornithological Society and Christine Carpenter, animal savant par excellence. This post is dedicated to the memory of Dan Nageotte.